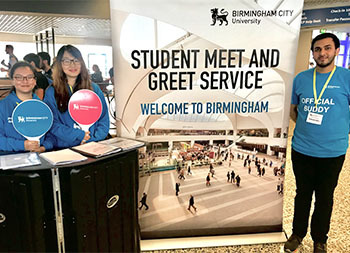 We operate a free ‘Meet and Greet’ service at Birmingham International Airport for new international and EU students. Our team will be available to welcome you, will answer any questions that you may have and will help with your transfer by coach or taxi to your accommodation. This service is only available on specific dates. Deadline: You must book by 27 June 2019, to secure your collection. Before planning your arrival please check the date on your accommodation contract. You may not be able to access your accommodation until a specific date and will need to make alternative arrangements in advance of your arrival. The service is only available from Birmingham Airport to accommodation located within a three mile radius of Birmingham City University City Centre Campus. You must register for the service in advance. Places are limited, book early to avoid disappointment. We may reduce the hours of the service if demand is insufficient. There is an Airport Taxi Rank located directly outside the airport building. All of the taxis are Black Cabs licensed by Birmingham City Council and operate a 24-hour, 365 day service. Birmingham Airport is approximately 15 miles from Birmingham City Centre and this journey will take around 30 minutes. The taxi from Birmingham Airport to your accommodation will cost approximately £30 - £35. All taxis from the Airport Taxi Rank accept major debit and credit cards, or you can pay with UK Pounds Sterling. If you are not arriving at Birmingham Airport, see our Arriving in the UK page.